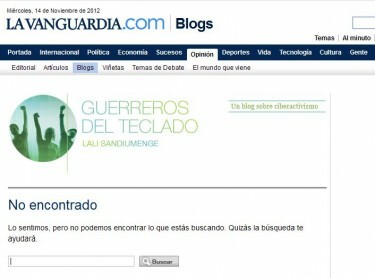 Catalan journalist and Global Voices contributor Lali Sandiumenge  recently decided to disassociate her blog on digital activism, Guerreros del teclado  [es] or “Keyboard Warriors” from Catalonia's leading daily newspaper, La Vanguardia  [es]. The decision came after the publication's editorial staff decided to delete her post explaining a hunger strike  [ca] in Barcelona by six workers of Telefónica, a telecommunications company in Spain. Imatge del bloc després de ser retirat el post. Sandiumenge has been a freelance correspondant in Cairo for various newspapers and media outlets. On March 1, 2011, she decided to associate her blog  [es], which shestarted in 2007  [es], with La Vanguardia in the hope of tackling the topic of cyber activism. On November 9, Ms Diumenge published an interview with six Telefónica workers to shine light on their hunger strike and analyze their use of the internet to combat the mainstream media's “siege” against them. On Monday, the leadership at La Vanguardia decided to censor the post and deleted it. They called to inform me of their decision. They didn't ask me to disassociate the blog, but their actions directly conflict with what I believe as a citizen and a journalist. In this light, I have decided to cut ties. It's a question of principles. On this — now personal — blog I have posted my article (with its original date) about the hunger strike, which has entered into its tenth day and I hope it continues for many more. Onward. Ms Sandiumenge has relaunched her blog on WordPress. At the new address  [es], users can find the article  [es], that La Vanguardia censored, which describes how the Telefónica workers have utilized the interent to make their case. “La red es suya y estamos luchando en su propio terreno”, explica Isabel, una de las trabajadoras de la compañía, miembro del sindicato Co.bas  que, junto a En Construcció y la plataforma Sí, soy rentable , abierta por los trabajadores, coordinan el frente de batalla abierto en el ciberespacio. Teléfonica es, con casi 5,5 millones de líneas de un total de 11.164.966 (datos del 2011), el principal operador en España de banda ancha fija, aunque su cuota de mercado ya no es mayoritaria como antaño. El ajetreo online –articulado sobre todo a través de @HHTelefonica  y @sisoyrentable , una cuenta  para retransmitir en streaming y el blog Vaga de fam a Telefónica - va parejo al que se vive sobre el terreno. “The internet is theirs and we're fighting on their terrain,” explained Isabel, one of the company's workers and member of the union Co.bas  [es], which is waging the online battle, alongside En Construcció or “In Construction” and the platform Sí, soy rentable  or “Yes, I'm for sale” [es], both worker initiatives. Teléfonica, operating nearly 5.5 million lines of Spain's 11,164,966 (2011), is the country's principal broadband internet provider, although it no longer commands a majority of market shares, which it did last year. The online debate — primarily articulated by @HHTelefonica  and @sisoyrentabe , accounts associated with Vaga de fam a Telefónica  [ca] (“Telefónica hunger strike”) — is occurring alongside what is happening on the ground. In the article, Ms Sandiumenge continued to explain a variety of online actions that have allowed the activists to give visibility to their claims, which implicate one of Spain's most powerful companies. @LaliSandi  Post republished. Are the workers rehired?